As most will be aware, in recent times (late 2016) there has been a large increase in available LNWR models - especially Alec's excellent LNWR coaches and my LNWR passenger tank locos - along with other existing LNWR models, I thought it was time to have a dedicated LNWR era route. After browsing the potential existing routes, I made the decision to rework the 1960's era Black Country back to 1920 LNWR era. As I've assisted him before, Don Hinton, gave me permission to backdate the route, and I have been working on it for a few weeks now. Don's original route has extensive ex-LNWR lines, plus a fair amount of ex-MR and ex-GWR lines and a small amount of ex-NSR lines. CAVEAT - please note that I am ONLY backdating the LNWR lines, I have NOT attempted to rework the MR, GWR or NSR lines - the aim of this route is to run LNWR trains only. However, I have done a small amount of backdating where the Other lines join the LNWR lines, so the 1920 theme can be retained - users can also run AI trains over the adjoining Other lines in conjunction with the LNWR player trains. The route is being reworked with MSTS route editor, but I am also running tests so that the final release will work equally well in either MSTS or Open Rails. As the current LNWR stock in mostly passenger locos and coaches, once the route is released, I'll move on to looking at adding a couple of LNWR goods locos and some more LNWR goods wagons to round out the available LNWR trainset. PLEASE NOTE - the route will be released WITHOUT stock - users can build their own appropriate LNWR trainset from available stock. Secondly, the route will NOT come with Activities - for two reasons, I'm rubbish at making Activities and there are no other activity writers in the Australian MSTS community. Accordingly, I'm open to UK activity writers making appropriate activities after the route is released. Edit - PS - in case you're wondering how effective an Aussie can make a UK route look - I have made an in depth study of the LMS and its Constituents for more than 60 years - I have over 100 LMS related books - my love of the LMS started when I was given a Tri-Ang 'Princess' set for my birthday in 1955. That sounds great, and would definitely solve the problem of a lack of routes suitable for the excellent LNWR stock now available. I had considered making some (simple) acts using your loco's and Alec's coaches, but will now wait for your route before doing that, a map highlighting the parts of the route that were LNWR would be helpful to those of us that are less knowledgeable in this area to create LNWR activities for the route. Judging from your past work, I have no doubt as to your effectiveness in producing a UK LNWR themed route, I very much look forward to seeing it. This is absolute great news. 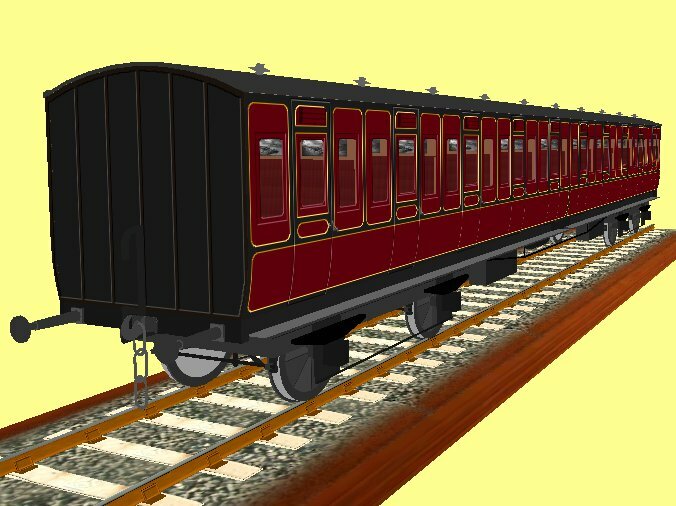 Another fillip to complete more LNWR carriages, as well as adding LMS liveried versions. I look forward to its release as and when! HERE might lead to more useful information about the London and North Western Railway. 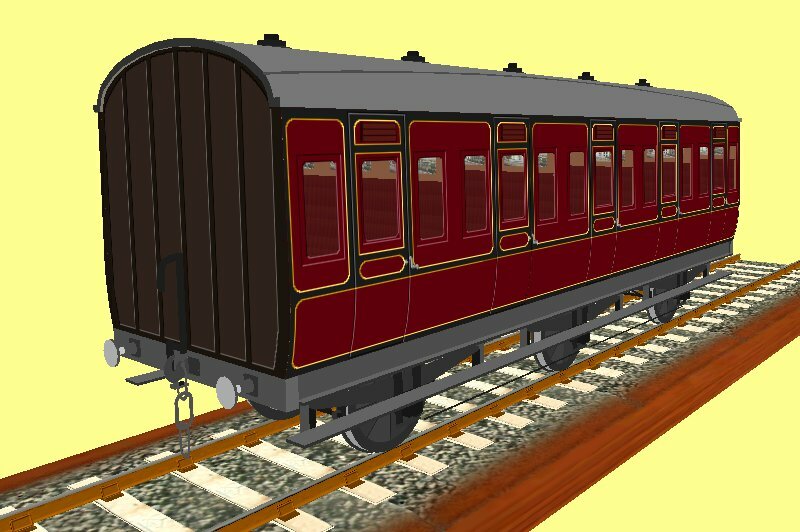 Alec's read me stated that some LNWR coaches lasted into BR days so I was tempted to try a repaint. Then I read this post so decided to try LMS fully lined livery. It was then easy to do other coaches using cut and paste. 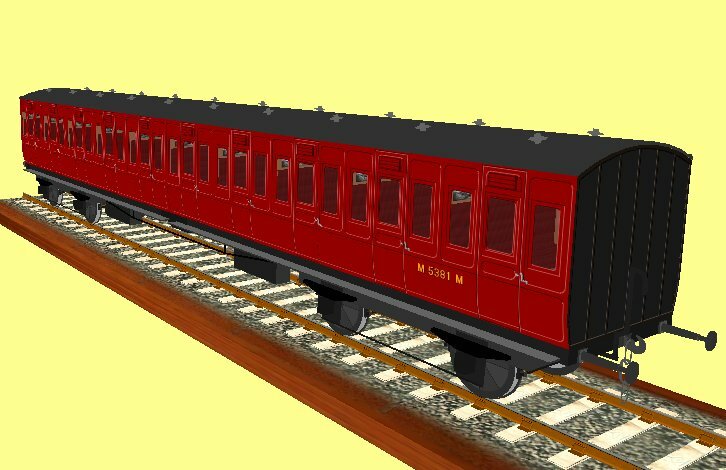 I do not propose to do all the LNWR coaches but I am happy to send the files to anyone willing try repainting using cut and paste or PSP selections. So long as Alec approves. I don't have any objections at all, although I was intending to do LMS liveried versions myself. In general the readme file in each upload indicates whether the carriages lasted into LMS and British Railways. Obviously I would appreciate recognition of my work as well as an email or PM saying what people are intending. I should point out that those coaches taken into LMS ownership used the 1923 numbering scheme - that's the one I will be using - and were included in the 1933 renumbering scheme where relevant. Again it should be noted that not all my uploaded carriages lasted into British Railways days; e.g. very few if any 42ft lasted beyond mid 1940s. I will endeavour to list the modelled carriages with an indication of when they were built and when they were withdrawn over the next week. Another pre=Grouping route is great news. Many thanks (in advance). Really looking forward to it. 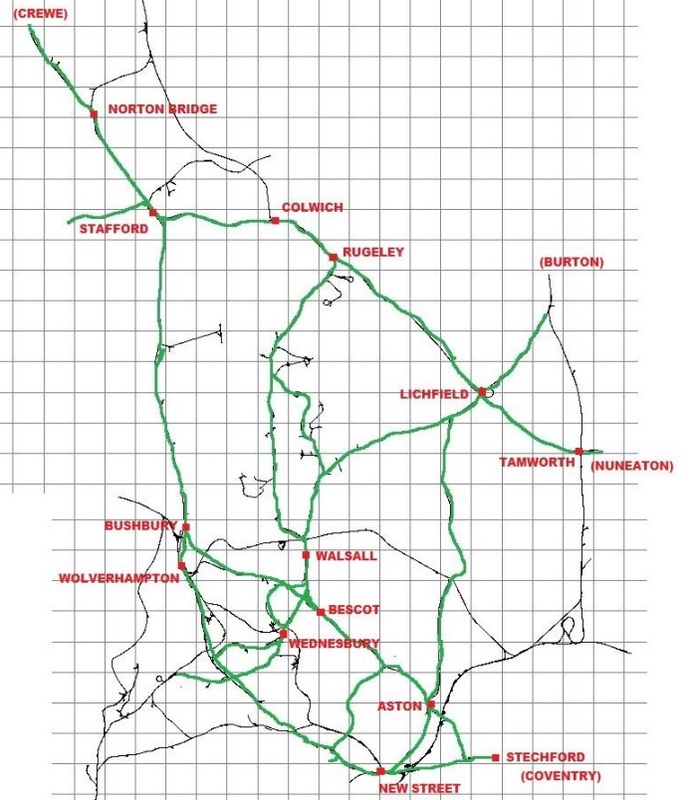 I've put together a basic Map showing the extent of the LNWR lines in green - the MR, GWR and NSR lines can be easily identified as well as the extent of private colliery and industrial lines that Don included in his original Black Country 60's route. Seeing your screenshot with UQ signals, thought I would give a little push towards a kit of LNWR LQ signals over on UKTS (7756), a time consuming job changing from UQ to LQ I know, the distants are pre-grouping, red fish-tailed. Yes, I am fully aware of your excellent LNWR signal kit. However, when Don originally built Black Country, he set it in the 50's/60's era and used the the LMS/LMR upper quadrant signal kit along with some colour-lights (baring in mind that I'm NOT touching the GWR, MR and NSR lines in the route, so left them as is). When I was looking at Black Country as a candidate for back-dating, I did a fly-through and estimated that the ratio was about 20% colour-lights / 80% semaphores. Looking at the overall magnitude of the task and considering how much stuff I have to cram into a 24 hour day, and the time I have available to work on this route, I made the decision to simply change the colour-lights to the same semaphores that are already in the route. Apart from the signalling, there are also a number of other compromises within the route - Don put in many collieries and industrial sidings, many of which are post-WW2 era. I have deleted a couple that are quite obviously 60's era only, and three of the power stations built in the 50's/60's are no longer in the route. So, based on my 50 year plus study of the LMS and its Constituents, I've tried very hard to capture the 'essence' of the LNWR in 1920 - without having heaps of authentic photos of every part of the route for 1920, I can only do so much ! In an ideal world, it would be nice to change them all over to authentic LNWR signals, but I really could not dedicate the time required to make the full change. 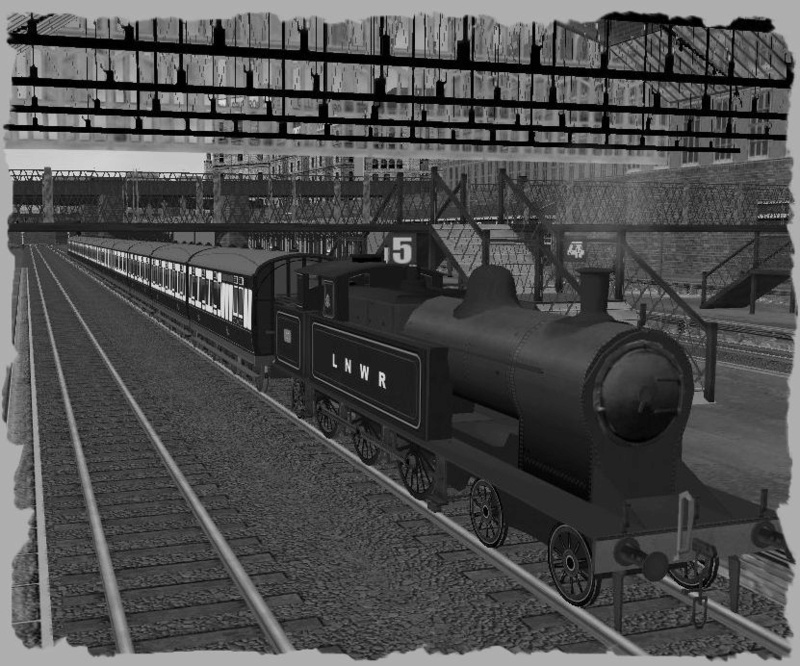 The whole idea of this route is to have a 'reasonably realistic' LNWR route on which to run all the new LNWR stock that is becoming available - I had no intention of trying to produce an accurate route as it would have looked in 1920. Even Don himself has stated that some parts of the route are pure 'modellers license' due to lack of prototype information. At least this route will give us one good route on which to run LNWR trains - if anyone else wants to make an authentic LNWR route to the standard of Skipton 1920 (RIP Pat Dalton), then feel free to do so. I also know of another author who is also back-dating another well known LMS/BR route back to LNWR era - as his 'blackboard' is a far bigger route, I doubt he would be any more accurate than my methodology. And .... just to push the Black Country - LNWR 1920 along a little bit, here's a shot of the remodelled Stafford station, with the 'colonnaded' platform lines and the Fast lines running through the open section in-between. It also shows the two new LNWR TPO vans I've built (coming soon !). We're in heaven it would appear! Brian has allowed me to see an advanced copy of this route, and so far it is looking very good! Here's a screen shot if the unique Birmingham-Sutton set setting off from Birmingham behind a LNWR 4-6-2 Passenger Tank. (Hopefully I'm not trying to be too clever? The discussion of a Pre-Grouping Black Country route has made me think about rolling stock to complement the excellent locos, carriages and wagons now on offer. Even if the non-LNWR parts of the route are not altered there will be a need for locomotives and passenger stock from a few other companies, for example at Birmingham New Street and Wolverhampton, as well as goods wagons from a wide variety of companies. I do not do any route building or stock creation, but I would like to be able to contribute to say a small thank you to those who have made so much available for MSTS. If it would be helpful, I am happy to create a list of existing suitable rolling stock now available from the various sources. Two obvious starting points of course are the existing Midland Railway route and the Highworth route. I suspect that PO wagons will be a problem as most of those on offer are on 1923 RCH vehicles and we really need vehicles on 19th century and 1908 design bodies and chassis. Also, livery styles changed even when the colliery or company continued to trade. One think I may be able to help with here is artwork for bodies created by others, though preferably black and white as my technique involves manipulating published photos. Today I have uploaded the Black Country - LNWR 1920 route to UKTS - it is available for download now. Please read the documents to understand the limitations and operational possibilities of the route. PLEASE NOTE - NO activities or stock is supplied with the route, but a list is supplied to assemble a suitable LNWR era Trainset. As I'm unskilled in activities, I invite any experienced activity writer to have ago at making suitable activities for the route. Brian, can the Animated TPO coaches be made to animate if you make the route electrified? I hadn't thought of that - I think it is worth a try. Give it a go and see. I only use my MSTS installation now for route building, all running is done in OR. When I made them they worked quite OK in OR but would not work in MSTS, so I assumed it was something to do with the way the .eng file was coded. It has been my experience in MSTS when testing my LNER TPO vans when I had the nets animated that if you use the pantograph animations (therefore making the coach an electric item of stock) and run it behind a steam/diesel locomotive, then MSTS won’t play fair and allow the animations to work despite the route being electric as well. For some silly reason the pantographs would only activate behind an electric loco. I must admit that I never tried making the coaches as an engine…. Using MSTSBin door animations presented another odd hurdle: yes the animations would work – just not at speed, the train had to be stationary to activate the animations. Hardly appropriate for a non-stop pickup. As for how OR would take to the functions – I have as yet to attempt a trial. I have tried this behind a steam loco on a MSTS electrified route and unfortunately it does not animate. Yes, I found the door animations would only work when the coach was stationary, so I used only the panto animations, one panto key opens/closes the doors and swings the traductor bags down/up, and the other panto key opens/closes the net. As they won't work in MSTS behind a steam loco, maybe, just maybe, someone could make a non-powered (or very low power) invisible electric loco which could be attached in front of the train loco. I don't have the skills to do that, so would rely on someone else to make one. I don't know if it would work or not, but logic says it might just work. It's worth a try !